Last weekend was OnStage (Stampin’ Up!’s convention) and as part of the convention, we find out what products are retiring. One of the first things I did after getting home was pull all my retiring products out and evaluate. Some I’ll keep. Some I’ll sell after the new catalog comes out. And all I’m going to try and highlight before the new catalog launches. Today is the start of my month and a half long series highlighting all those wonderful products! Today’s card highlights two big retiring products: Birthday Wishes for You Stamp Set and Best Route DSP. This particular DSP is very fun, but somehow I didn’t use much of it over the past year. 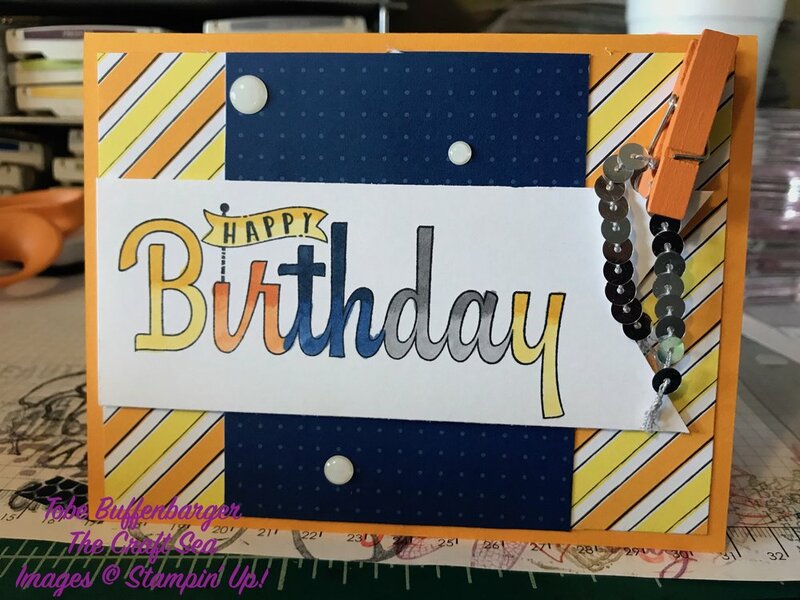 Thankfully it pairs very well with the Birthday Wishes for You Stamp Set. I stamped in Momento ink (best for alcohol based markers) and colored it in using my Smoky Slate, Night of Navy, Pumpkin Pie, and Daffodil Delight Stampin’ Blends. I turned a simple outline sentiment and made it pop with fun colors and blending. After getting my sentiment set, I added some layers of pattern paper and lots of fun embellishments. Today’s card took me awhile, but I do love coloring in my stamps! This particular one is retired, but it oh so much fun! Today’s card is another attempt to use some great scrap pieces of DSP. I loved the Delightful Daisy DSP pack and have a few scraps left over. I pulled those, started layering, and came up with this design. I added a simple stamped daisy and sentiment to finish off the card.